The gold market has been mired in a four-and-a-half year basing pattern. The rally that began late last year has taken prices up toward a major resistance zone. It’s make or break time! Also on the cusp of a potentially big move is the bond market. Bonds haven’t been making headlines like the stock market, but where the bond market heads next could be crucial for stocks as well as metals (not to mention housing and lending). The 30-year Treasury bond is forming a potential head and shoulders top. 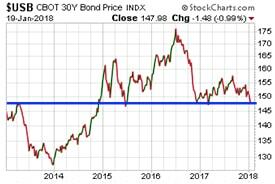 A sustained break below the major support line would confirm a new bear market in bonds. Lower bond prices would mean rising long-term interest rates – a potential precursor to rising inflation rates. The government shutdown doesn’t do anything to inspire confidence in the creditworthiness of the U.S. Treasury. Although no immediate threat of default exists, brinksmanship could escalate in future showdowns. The government shutdown of 2011 caused the U.S. to suffer its first ever credit rating downgrade. Senate Democrats pulled this latest political stunt over DACA – a controversial amnesty program for children of illegal immigrants. DACA affects very few Americans directly. It barely registers as a line item in the $4.1 trillion federal budget. Yet it caused the government to lock up and threatens to lead to a constitutional crisis down the road. The investing implications of gridlock, dysfunction, and chaos in Washington aren’t immediately clear. Past shutdowns have seen volatility pick up, but neither equity nor precious metals markets have shown any consistent tendency to trade in a particular direction during or following shutdowns. According to Bank of America Merrill Lynch analysts, when gold prices and bond yields are both rising in tandem, that spells danger for the stock market. The Black Monday crash of 1987, for example, was preceded by rising gold prices and bond yields in the months leading up to that fateful October. The U.S. stock market and economy have been fueled by easy money for the past several years and are now extremely leveraged. Margin debt balances are at record levels. And despite recent strength in employment and GDP numbers, the U.S. government is headed for trillion-dollar deficits. A rise in borrowing costs threatens to unwind leverage in the equity markets and hit Uncle Sam with huge increases in debt servicing costs. Rising bond yields (falling bond prices), rising stock markets, and rising precious metals rarely co-exist together for long. One or more of these trends can be expected to soon break the other way. 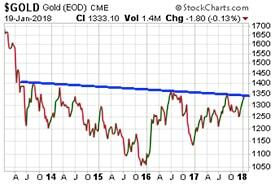 If gold rallies above resistance and bond prices fall through support in the days ahead, then stock market bulls will have cause for concern. Next Article Falling dollar, rising gold – where will that take us?